Note: The content on this page is available as a tri-fold brochure in PDF format. In the 19th and 20th centuries, unwanted waste product from coal mining was dumped into piles that sometimes grew to millions of tons. These coal refuse piles (also called waste coal, gob, culm, boney, or slate dumps) are composed of other minerals extracted incidentally along with coal. However, the process that separated the waste from coal was imperfect, so the piles invariably contain some coal as well. Today, these “gob piles” are common throughout Pennsylvania’s coal country: huge eyesores with dangerous, unstable slopes. They absorb solar heat to become so hot they cannot support vegetation, and heavy erosion from these piles becomes a source of acid mine drainage, which contains heavy metals and acids that pollute streams and rivers. Besides the environmental degradation, gob piles sink property values and contribute to economic decline in Pennsylvania’s communities. Partnerships between watershed groups and private industry can clean up these polluting legacies and burn their fuel for electricity. Power companies are able to burn the coal that was left behind in gob piles using a technology called Circulating Fluidized Bed (CFB) combustion. CFB boilers use strong jets of hot air to suspend pulverized coal refuse, allowing the coal in it to burn more completely and efficiently than in a conventional coal power plant. The burning fuel creates heat to produce steam, which drives electric generators. CFB boilers use relatively low temperatures to combust coal, emitting less nitrogen oxide (NOx) pollutants. CFB plants also inject crushed limestone into the boiler, which combines with sulfur in the gob to create an inert solid that is captured to minimize airborne sulfur (SOx) emissions. 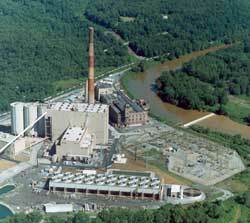 Using appropriate pollution controls, CFB power plants meet EPA and DEP air quality standards. Ash leftover from combustion in a CFB boiler is alkaline and well-suited for mine reclamation projects. The ash is often hauled back to the same site where a gob pile was removed, where it can be mixed with soils around abandoned mines to neutralize acidity and immobilize heavy metals. The Commonwealth of Pennsylvania has certified CFB ash for beneficial use in mining reclamation projects, and the Dept. of Environmental Protection regulates and routinely tests it. As of 2002, CFB plants have enabled privately-funded reclamation of 3,400 acres of mine lands. How do I get rid of my waste coal pile? Energy companies can reclaim abandoned gob piles because the waste coal provides cheap fuel. For an energy company to make a profit, however, a gob pile needs to have relatively high energy and low sulfur contents and be close to the power plant. Moreover, most CFB plants in Pennsylvania already have enough fuel to last 10–15 years. To make your gob pile appealing, it must have better economics than their existing reserves. One large factor in this is its proximity to the power plant, which should generally be under 50 miles. 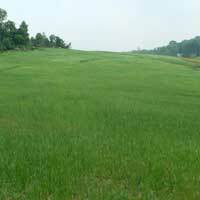 opportunities for subsidies by including the reclamation in grants or other projects. Usually, the energy company will sample the waste coal upon receiving a promising proposal, and will not accept any sampling results from you or a third party. If it is cost-prohibitive to burn a gob pile in a CFB power plant, the pile may have to be spread out and mixed with soil and alkaline material to allow revegetation of the area. Formed in 1982, the Western Pennsylvania Coalition for Abandoned Mine Reclamation	is a non-profit, non-partisan, local, state, federal, and industry partnership dedicated to improving the local economy and enhancing the quality of life reclaiming the abandoned mine lands and degraded waters of Western Pennsylvania. A coalition of 24 county conservation districts, WPCAMR’s efforts expand into areas where reclamation is limited, showing local communities that their polluted lands can be clean and giving people hope where little existed in the past. WPCAMR endorses community-industry partnerships that use circulating fluidized bed technology to remove waste coal piles and reclaim abandoned mine lands.